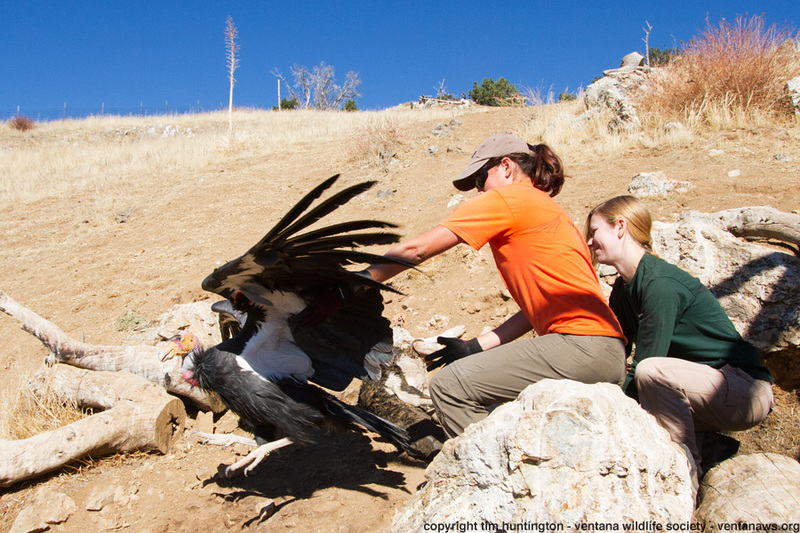 Recently, I was fortunate enough to be able to accompany the staff from the Ventana Wildlife Society as they performed health checks on two condors. 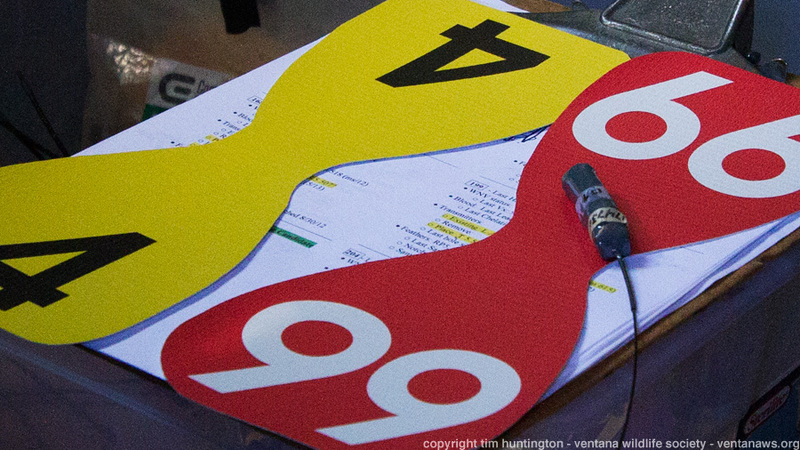 The rest of this post is a photo essay on why checks are necessary and what's involved. 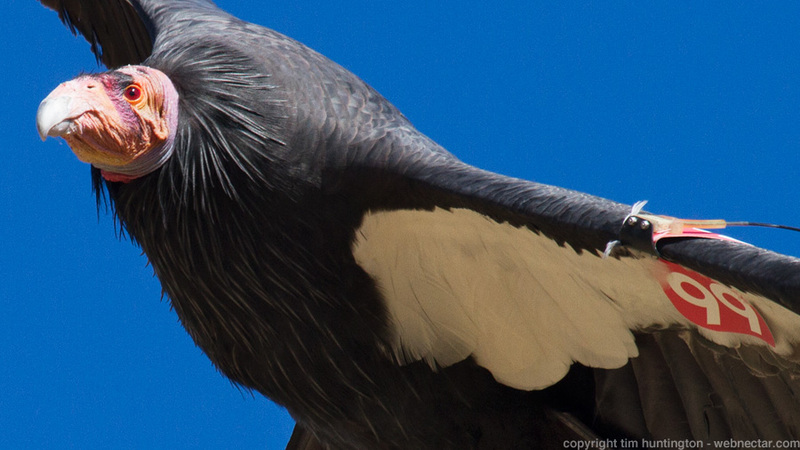 California condors are typically trapped and given a health check twice a year, primarily to have their blood tested for its lead level and secondarily to have their tags and radio transmitters replaced. Radio transmitters are necessary to track the birds’ movements and determine their fate. 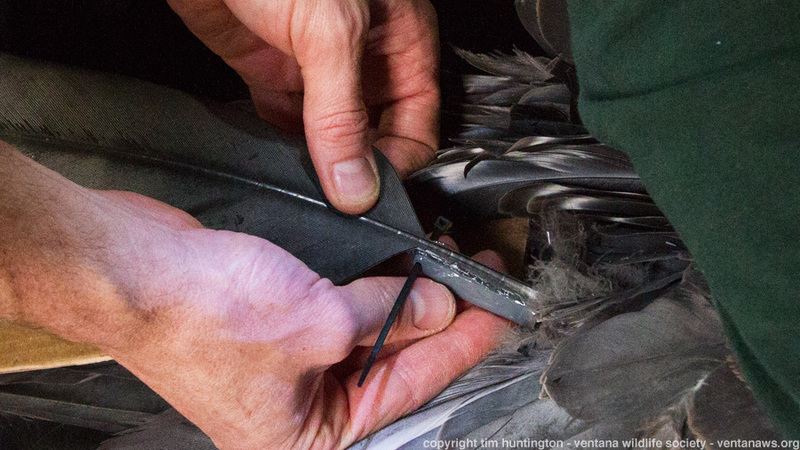 While birds are still falling prey to lead poisoning on a regular basis, these checks are an unfortunate necessity in the ongoing recovery of the species. 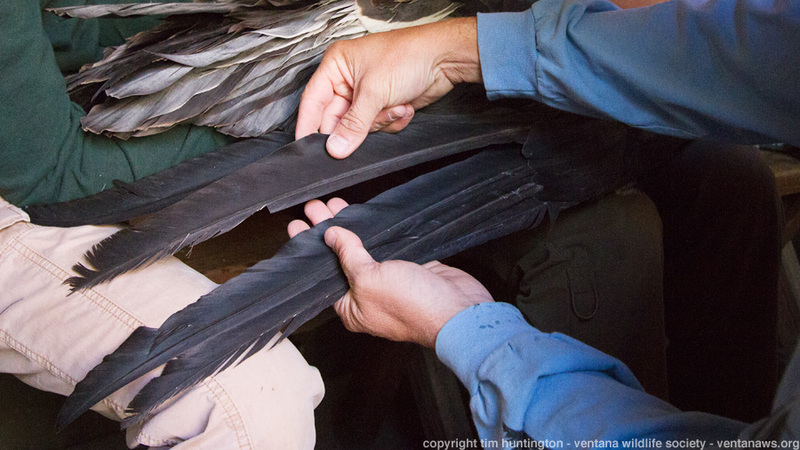 These lead tests, and the subsequent treatments for exposed birds, have saved and continue to save condors' lives. 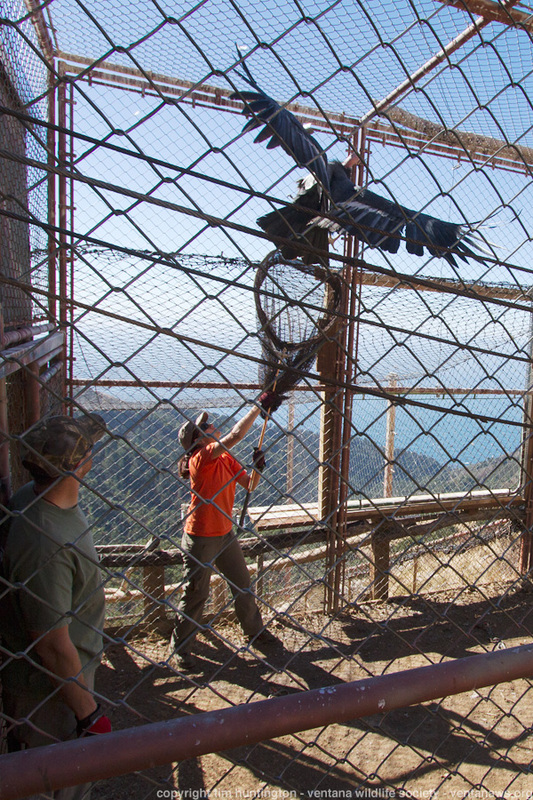 On November 5th, 2013, Big Sur condors #204 "Amigo" and #199 "The Great One" were checked having been trapped in the Ventana Wildlife Society's flight pen in Big Sur. This blog posts shows what was involved in their health checks. 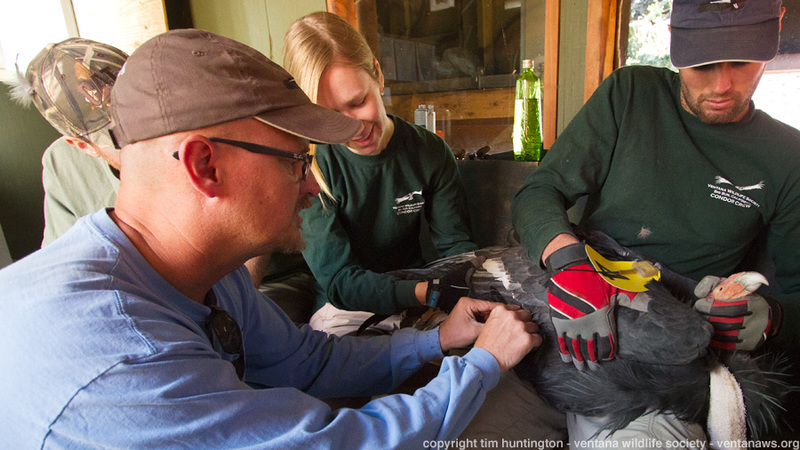 Once birds are trapped in the flight pen, VWS biologists perform the health checks. The biologists brought new tags and radio transmitters with them to be attached to the birds during their checks. 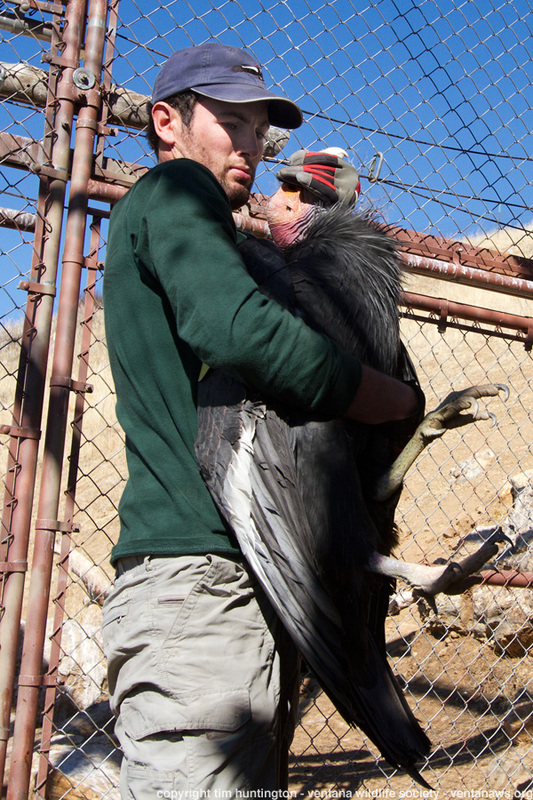 Before a check can begin, the condor has to be carefully netted inside the flight pen. The VWS staff take their time, letting the bird dictate the pace. Here, Condor Intern Melissa Clark patiently nets a reluctant #199. Once netted, the bird is then carefully transferred to the blind where the check can commence. Here Condor Intern Andrew Wighton carefully transports #204. The bird is carefully held by at least two people, in this case Andrew controlling the body and head (and beak! ), and and Condor Intern Robin Jenkins controlling the feet, to help ensure that neither the bird or the people get injured. Fans blow cooling air on to the bird and damp towels are also applied to keep the bird as comfortable as possible during the check, which takes approximately 15 minutes. 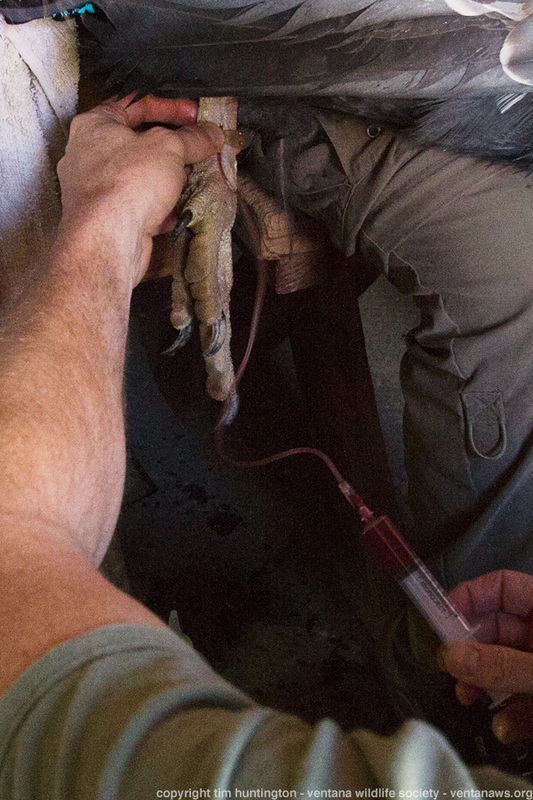 The bird's lead level is determined via a blood sample, so a biologist draws some blood from the bird's leg. 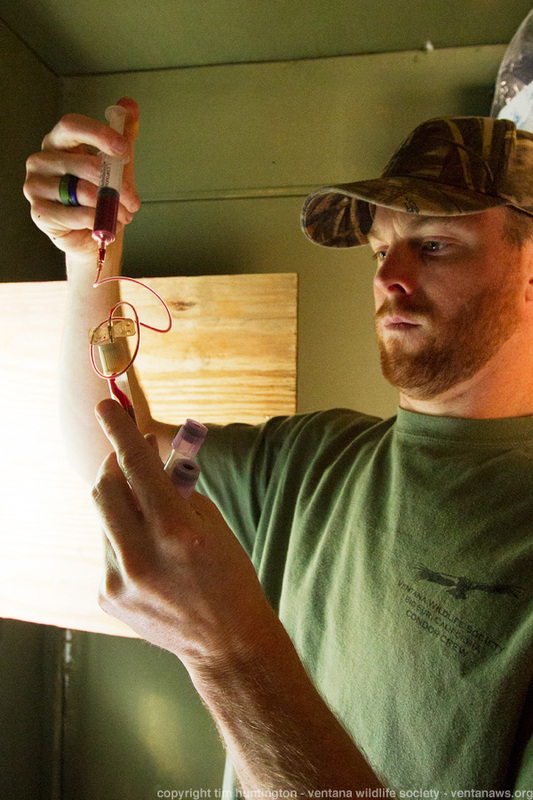 Wildlife Biologist David Moen uses some of the blood iimmediately to test the lead levels of the bird, the rest is sent to the lab for analysis. While waiting for the on site lead testing machine to come back with its results, new tags and transmitters are fitted to the bird. Here a new radio transmitter is attached to one of #204's tail feathers. The general condition of the bird (head, feet, feathers etc.) is also checked. Here #199's primary feathers are given a look over. Finally, Senior Wildlife Biologist Joe Burnett gives the bird a West Nile virus vaccination. Due to this disease only recently appearing in North America the vaccination helps to ensure that condors develop an immunity to the virus and it does not become a threat to them. 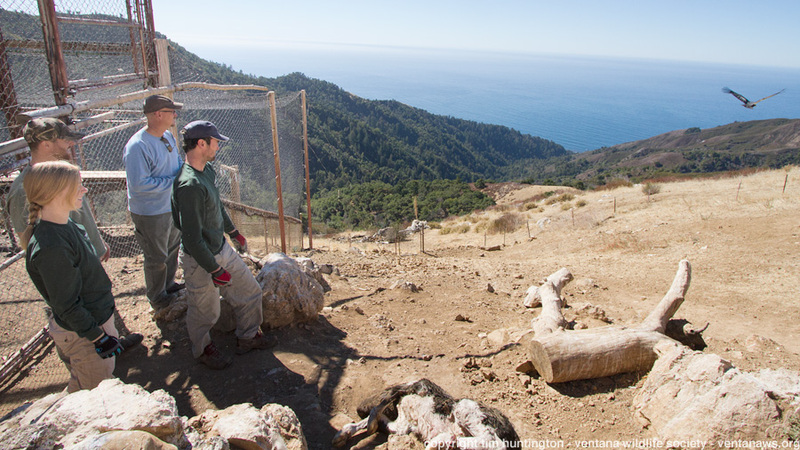 Thankfully both birds' lead levels were low, so they were both released back into the wild in Big Sur. Here #199 takes flight after he is removed from the blind and placed on the ground. Had either bird had high lead levels then they would have been transported to the LA Zoo and joined a record number of condors that have or are being treated there this year for high lead levels. #204 leaves the flight pen area after his health check. No one is happier than the birds and the VWS team when a bird is healthy and can be released back into the wild. All parties are looking forward to the day where these trap up health checks are no longer a necessary part of the condor's recovery. After release, condor #199, complete with new wing tag and radio transmitter, flies free over Big Sur.